This week marks the 48th annual Specialty Equipment Market Association (SEMA) show in Las Vegas, Nevada. The SEMA Show is the premier automotive specialty products trade event in the world and draws the industry’s brightest minds and hottest automotive products to one place. Building on the successful 2014 booth experience — which included a dynamic 3D projection mapped car — Castrol USA has once again tasked The CSI Group to design an interactive booth experience for 2015 that positions them as leaders in the motor oil industry. Using the theme of innovation, The CSI Group created a space that leveraged virtual reality, a captivating video wall powered by BrightSign Network and a social media giveaway to create an exciting and interactive booth experience at SEMA 2015. The centerpieces of the booth are Castrol’s Virtual Drift experience and a floating nine-screen video wall. Booth attendees will experience a thrilling virtual world utilizing the Samsung Gear VR headset and driving and drifting through a treacherous terrain in a virtual 2016 Ford Mustang GT powered by Castrol EDGE. To promote this experience, a nine-screen video wall was hoisted high atop the Castrol booth serving as a beacon, inviting attendees to experience the Virtual Drift in 360. The video wall features fast-paced Castrol EDGE Virtual Drift videos synced to play in perfect harmony across all nine screens as well as Castrol EDGE product vignettes — enhanced by booming sound effects, creating a truly immersive experience. The video loop was developed, encoded and programmed for playback on BrightSign 4k media players and then tested in CSI’s in-house video production studio. A social media contest was also developed to engage attendees and round out the VR experience. 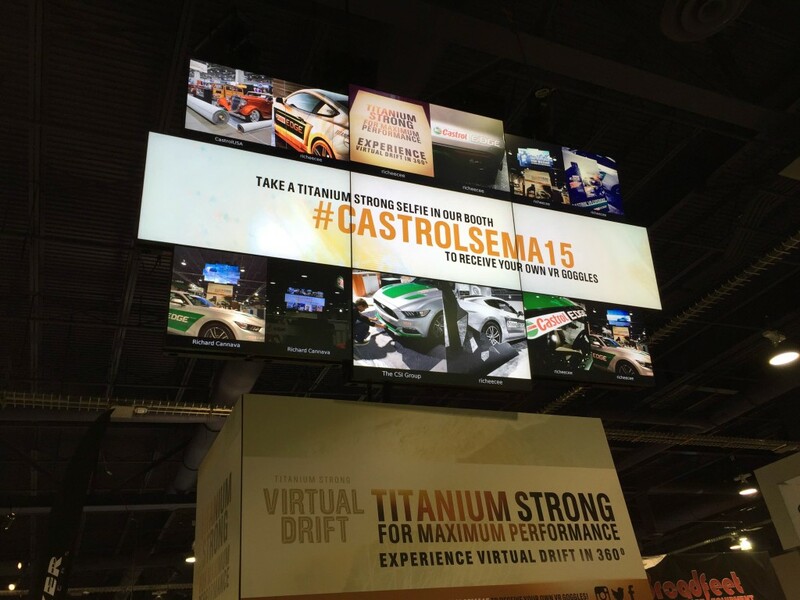 Booth visitors are invited to take a ‘Titanium Strong Selfie’ in Castrol USA’s SEMA booth, hashtag the picture as #castrolsema15 and post it to a social media platform in order to walk away with a pair of virtual reality goggles. Throughout the day, their selfies populate and take over the video wall alongside a call-to-action to come take part in the giveaway. The video wall takeover will serve as a unique way to drive traffic to the booth, boost excitement and engage Castrol’s attendees during the 4-day show. Engaging your attendees and cutting through the clutter at a tradeshow can be a difficult goal to accomplish. 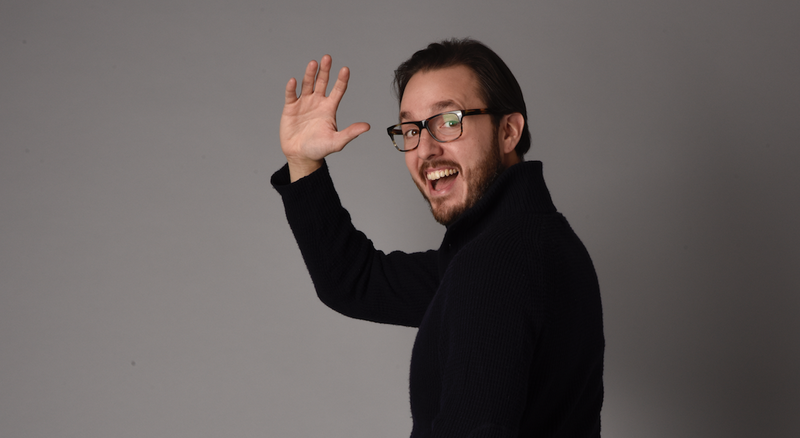 With every exhibitor putting their best foot forward and striving to be the best, it’s imperative that your booth presents your brand’s unique story in the most strategic and aesthetic way. The CSI Group are experts at video content production, custom programming and experiential Marketing. To learn more about how to enhance your company’s presence at your next tradeshow or event, contact The CSI Group at hello@thecsigroup.com or visit us online at https://www.thecsigroup.com.